Drake says: "Pandemic is a cooperative game for 2 to 4 players. Four diseases have broken out in the world and it is up to a team of specialists in various fields to find cures for these diseases before mankind is wiped out. Players must work together, playing to their characters' strengths and planning their strategy of eradication before the diseases overwhelm the world with ever-increasing outbreaks. Time is running out! If disease spreads uncontrolled, the players all lose. If they find the cures, they win." John says: "A truly cooperative game where you all win or you all lose. Pandemic is a highly social game in which Table-talk is encouraged, and essential in order to win together. This is a unique experience and an excellent introduction to cooperative designer board games!" But the diseases are outbreaking fast and time is running out: the team must try to stem the tide of infection in diseased areas while also working to find cures. 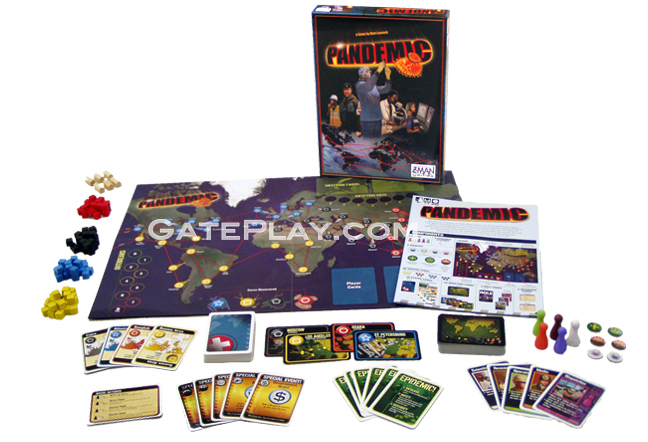 Check out "Pandemic" on BoardGameGeek.com! Hunchy says: "If you like the cooperative elements and "roles" in Pandemic, you'll enjoy Shadows Over Camelot, Ghost Stories, Space Alert, Shadow Hunters and Bang! The Bullet!